In other news—we gave away prizes yesterday! WINNERS from last night: Lifetime membership at the $20,000 mark—EFP (in Spain! ), #258. Craig Clevenger hardcover—Darryl Foster, #299! Paperback—Clark, #309. AND, anybody that pledges today (new) will get a free dirty limerick sent to the person of their choice (just in time for Valentine’s Day) by our staff poet, Heather Foster! Thanks for your continued support! HEAD OVER NOW! This entry was posted in Uncategorized and tagged $20000, Gamut, Heather Foster, Kickstarter, Laird Barron, winners, X's for Eyes. 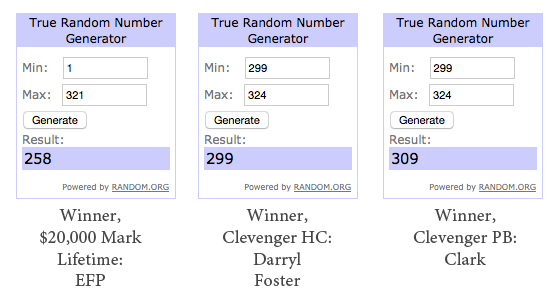 ← Day Nine Update: PRIZES! Darn. Does that mean I have to resort to Amazon for the Clevenger book? Afraid so! Both are great, though. Worth it. IMO.